This is because we pride ourselves on freshly preparing all of our meals to order. Where possible our ingredients are locally sourced and this is always true of the seafood. This arrives fresh off the local fishing boats in the afternoon to be cooked that very evening. This is our signature dish and can either be served freshly cooked on a large Seafood Platter or cooked to your individual specifications. 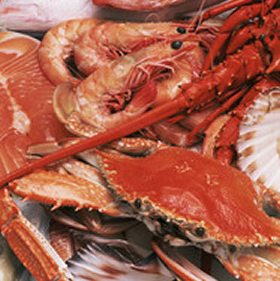 Choose from a selection of lobster, crab, langoustine, scallops, oysters, mussels, sea bass, turbot and wild salmon – however we should point out that some seafood is subject to seasonal availability and due to Islay’s ever-changing weather conditions, this can affect what we can source on the day. The Seafood Platter is a large dish and most people share one between two or more people however there have been those hungry guests who devour a whole one all on their own! It is recommended that you book your Seafood dinner at least 24 hours in advance as we order and cook all seafood upon request – catering for your individual requirements. If you don’t fancy anything on the menu, we will try and prepare a dish at your request.